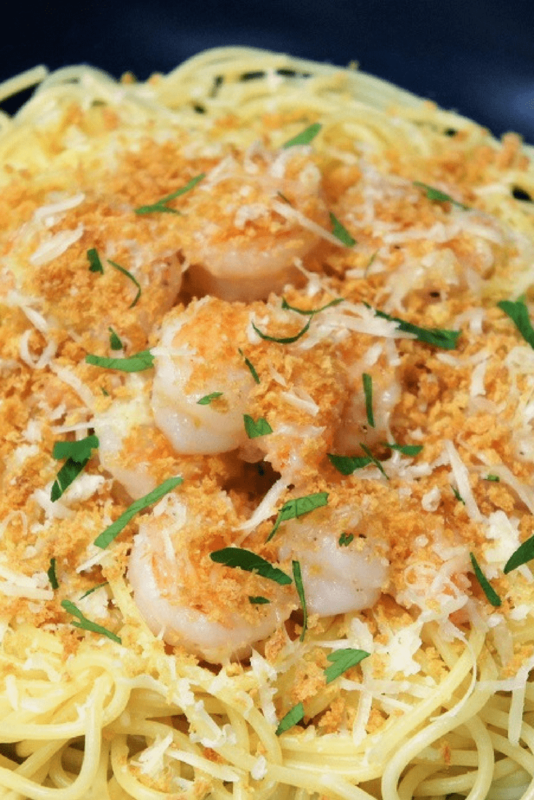 In this recipe large shrimp are gently sautéed with garlic and olive oil, then they’re topped with fresh grated Parmesan cheese and crunchy panko breadcrumbs. The garlic Parmesan shrimp is served on a bed of pasta making a delicious and filling meal. Quick, easy and the family loves it, so this shrimp dish is a go-to at my house for busy nights. Enjoy! Clean and peel the shrimp, season with a pinch of salt and black pepper and set aside. 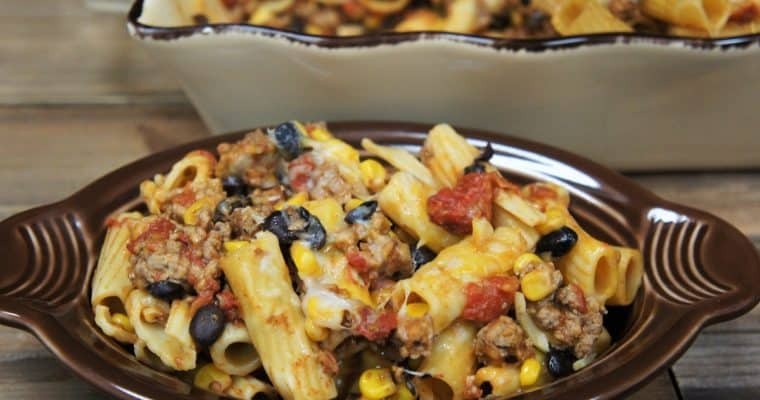 Fill a large pot with water, cook the pasta to package directions for al-dente. Remember to salt the water. Place the panko breadcrumbs on a baking sheet (we line it with parchment paper) in a single layer. Place the breadcrumbs in the oven and bake for approximately 7-10 minutes until golden and crispy (check on them after 5 minutes or so to gauge the rest of the cooking time). 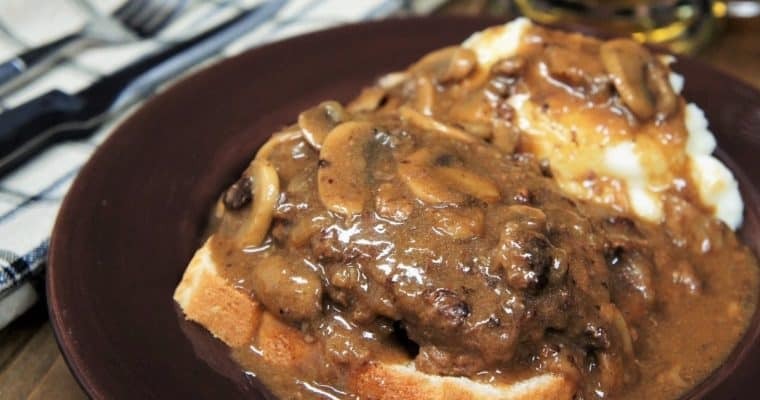 Remove the breadcrumbs from oven and set aside. Heat the olive oil in a large, deep skillet over medium heat. When the oil is hot, but not smoking, add the garlic. Cook gently, stirring almost constantly for 1-2 minutes until the garlic is fragrant. Take care to not burn the garlic; it will become bitter, and pretty much inedible. Add the shrimp to the skillet. Cook the shrimp, stirring and turning them frequently for approximately 5 minutes or until cooked through. The cooking time will vary, depending on the size of the shrimp. When cooked through, the shrimp will no longer be translucent, will curl, and will turn a nice, pink color. Look for these signs, as they will be a more accurate indication that the shrimp are done than the cooking time. When the shrimp is cooked through, remove the skillet from the heat, and add another pinch of salt and black pepper, if desired. 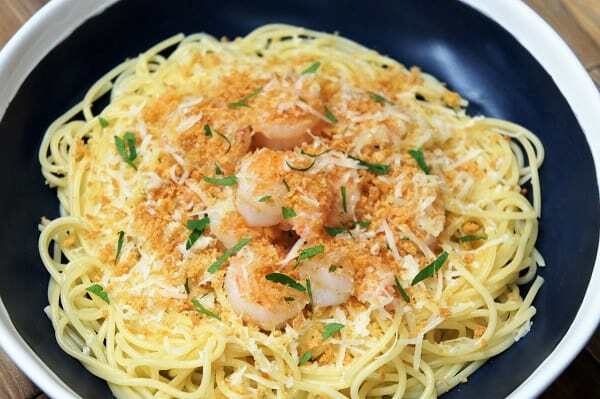 Serve the pasta in individual bowls, add a helping of shrimp and top generously with parmesan cheese and the crunchy breadcrumbs.